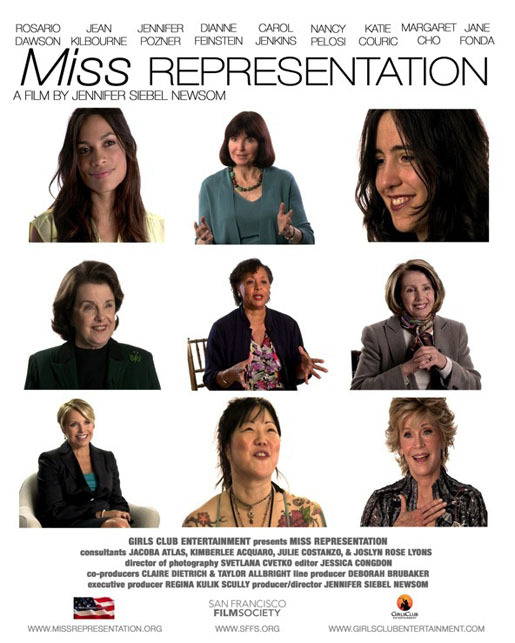 At long last a documentary about the under-representation of women in positions of power: Miss REPRESENTATION, is a documentary that focuses its attention on the hypnosis of the media and how we internalize gender roles in this country based on how the media portrays men and women, which automatically affects the disproportion of competence in America. As an American woman, this is something that I've realized most people want to, no-- absolutely NEED TO believe to be a falsity. As a society we need to believe that all is right in the balance of power between the sexes: because, if we must admit that something is off, if we must admit that women are still very far from the equality that everyone has fought for here in the US-- the very nation that wants to copyright the mere utterance of freedom--that would mean one thing and one thing only--that we as a so called "progressive society" are all implicated in the downfall of our current structure of power. Have a watch at this trailer and feel free to share your thoughts. We here at the NewsGallery think that this type of education should have been implemented in schools decades ago. Nevertheless, here it is now: a short version of the film will finally be part of the curriculum in middle schools and high schools arount the country--the gap that my generation of women desperately needed to fill to get us out of this stunted growth of power that we as women are more that partially responsible for once and for all. Written by Dawn Elardo, Founder and Editor of The NewsGallery.